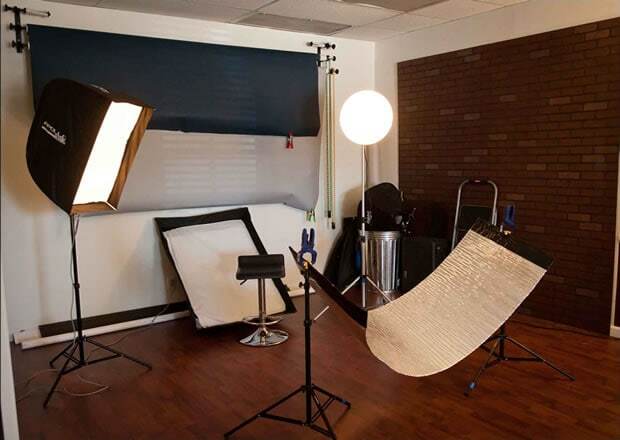 The shooting studio is approximately 15’x22’, which is perfect for business headshots or newborn sessions. A group as large as 8 can be photographed in the space comfortably. This is a meeting space that seats up to 10 people. It’s a perfect space to show clients your completed work and take orders for prints. A projector and screen is provided at no extra charge — Just bring your own laptop. The projector has a standard VGA port, so bring your own adapter if necessary. Any business type is welcome to rent the meeting space, you don’t have to be a photographer to use it! Note: bring your own pocket wizards or trigger. Interested in renting space? Contact us. In Studio Lighting is also available to rent at $20 per hour.